Tanya, Johnny and their four kids are joining the Watagan Park community after building their forever home. Tanya and Johnny are the type of parents who are dedicated to seeing their children thrive by creating a healthy lifestyle for them. Tanya is a registered midwife at Gosford Hospital, and Johnny is a primary school teacher at Wahroonga Adventist School, and while the two may have committed careers, you can tell that family is their biggest priority. Their children currently attend school at Wahroonga, which is roughly a two-hour commute each day from where the family now resides. This was what motivated the pair to choose Watagan Park as the place to set up their new home. “One of the main reasons that made us look at the area was the thought of being really close to a school, so within walking distance. And we had a great building experience the first time, and have always thought we’d want to do it again. So when the opportunity came up, we decided to do it,” shares Tanya. The laid-back, communal nature was also a big plus for Tanya and Johnny, as they wanted to create a safe environment for their children to grow up. 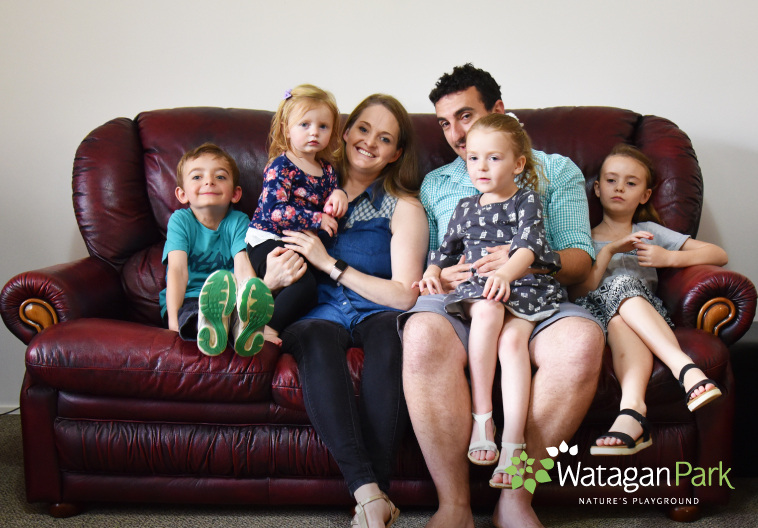 “For me, the Watagan Park lifestyle would let the kids be kids and allow for more time at home. They’ll have friends around the corner, play dates will be easy, and we’ll have our own friends around. So it will be a nice environment to socialise,” explains Johnny. “It just seems like a really nice, genuine, good community by the looks of it. They’ve got a Facebook page that shows people just being really supportive of each other and neighbourly,” adds Tanya. There is still a way to go with the build of their new home, but Tanya and Johnny are looking forward to making the big move with their family by Easter 2019.